If you have a surgery scheduled, Surgery Partner is a must have. Four separate hypnosis programs include Before Surgery, During Surgery Recovery Room Wake up, and After Surgery Healing. If you have a surgery scheduled, Surgery Partner™ is a must have. 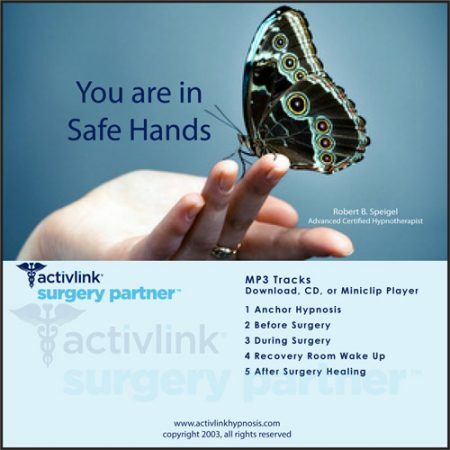 Four separate hypnosis programs include Before Surgery, During Surgery (to listen to while you are having the surgery) Recovery Room Wake up, and After Surgery Healing. An Anchor Meditation program is included to help you relax whenever you wish. It has been proven that if you are having general anesthesia or local anesthesia, your subconscious mind listens to the hypnotic suggestions contained in this effective program. Check with your surgeon or anesthesiologist if you can wear headphones during your procedure – most are quite agreeable. You are sure to have a much better surgical experience and faster healing using this program or we will refund your purchase price. I recently had my first surgery for repair of a tendon in my knee. Needless to say, I was a bit nervous about having anesthesia and also anxious to get back on my feet as quickly as possible. I purchased Surgery Partner based on a recommendation from a friend, who had used hypnosis to speed her healing. I started using the product 2 weeks before my surgery, and by the time the day arrived, I was mentally and emotionally ready for the procedure. My surgeon was supportive of me listening to the audio during the surgery, which helped me to remain calm and relaxed. Following the surgery, I was told everything went extremely well. I continued listening to Surgery Partner for 2 weeks, and enjoyed a rapid and stress-free recovery. In my post-up meeting with my Surgeon, he asked me what I had done to recover so quickly – he was amazed at the speed and extent of my healing. I truly believe that this product helped me to recover rapidly, and allow my body and mind to work together to heal me naturally. In May of 2014 I had back surgery, at that time I did not know about Surgery Partner and was very stressed and anxious about the surgery. I ended up having a very difficult time and a long and painful recovery. Then I needed a second surgery about a year later! I was a wreck just thinking about it, Rob Speigel suggested Surgery Partner, I really didn’t know if something like that would help but figured it couldn’t hurt. I listened religiously before surgery and right after. I woke up feeling so much better than I had the first time!! I felt ready to go home. Unfortunately I had to have an emergency vascular surgery the very next day. I listened to Rob’s very soothing voice and was able to get through a very tough time. I kept listening after the surgery and was up and around and ready to go home in a few more days. I truly believe the difference was Surgery Partner!! Thank you Rob Speigel for suggesting it for me! I would highly recommend it for anyone facing a surgery! Peggy from Cleveland, Oh.